Anyone who knows me is aware of my complete disinterest in sports. I did go to a National’s game back in 2012. I had every intention of making it to a game last year, but it felt like such a hassle to go to a game, particularly to cheer on a somewhat uninspiring team. Recently, however, the stadium/Navy Yard area has attracted my attention. It has become home to some appealing new restaurants including Blue Jacket Brewery, Agua 301, and Osteria Morini. Baseball wasn’t the only thing I experienced in the summer of 2012. I also visited the Soho, NY location of Osteria Morini. I marveled at the “rich and rustic raviolo filled with ricotta and topped with an egg and mushroom ragu.” When chef/restaurateur Michael White announced he was joining the cadre of successful out-of-towners opening restaurants in DC, I did a happy dance. I knew his rustic Italian cuisine would be another positive addition to our burgeoning dining scene. Osteria Morini’s cuisine is inspired from the region of Emilia-Romagna, known as the Italian Breadbasket. Executive Chef, Matt Adler, who trained with White at some of his New York restaurants, is now hitting it out of the park in DC. The ambience at Osteria Morini has some familiar ingredients: rustic feel, high ceilings, open kitchen. But it has a light/bright feel, which I find very appealing. The restaurant is packed on a wintry Saturday night, and it is certainly loud, but happily I can hear my five dining companions. Three of us (the women) decide to share dishes, despite my incessant complaints about shared plates. I have to admit that it is a most efficient way to experience a menu, and we’re in the mood to explore. We leave our men to approach the menu in whichever way they see fit. 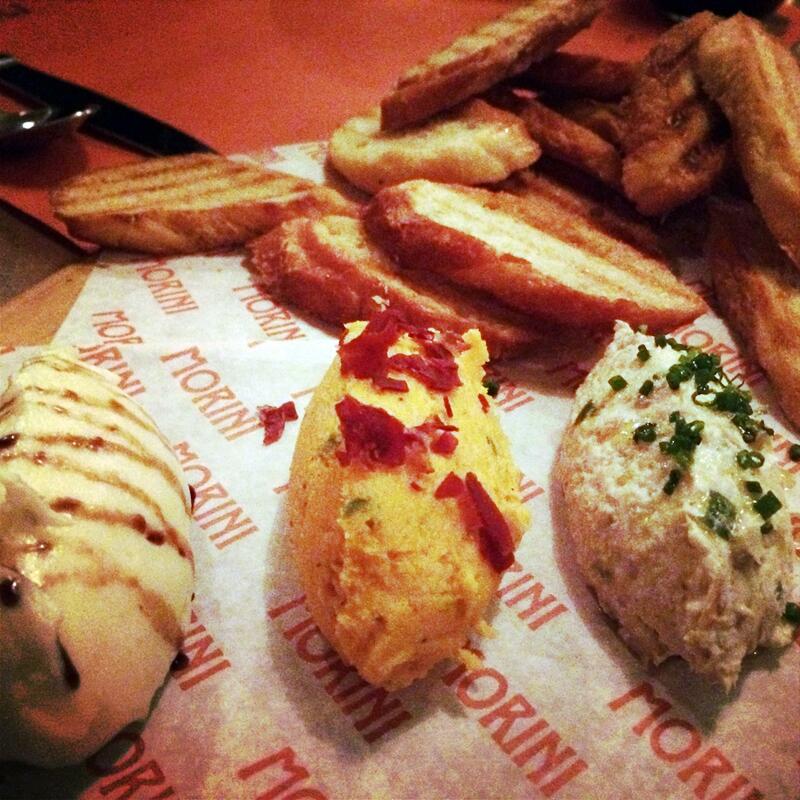 We nod in approval as a trio of spreads and crostini arrive with a heaping portion of grilled bread. Each spread is distinct in its flavor. Smoked trout is pureed with olives and sour cream; parmigiana “gelato” is dotted with aged balsamico; and winter squash mixes with sage and crispy speck. My preference is for the squash, with the specks of speck (a type of prosciutto), adding an extra layer of texture to the slightly-sweet spread. This would more than suffice as a starter for three people, but salad with wild arugula, more crispy speck, pears, and parmigiano sounds too good to pass up. You can never have too much speck. The perfectly-dressed salad proves to be a successful distraction in keeping us from eating too much bread, although ultimately we ask for a bit more to accompany our remaining spoonfuls of spread. Pastas are not to be missed at Osteria Morini. House-made and hand-rolled, I imagine that any ingredient that touches them will shine. Bucatini with crab, sea urchin, and basil is a satisfying way to go. 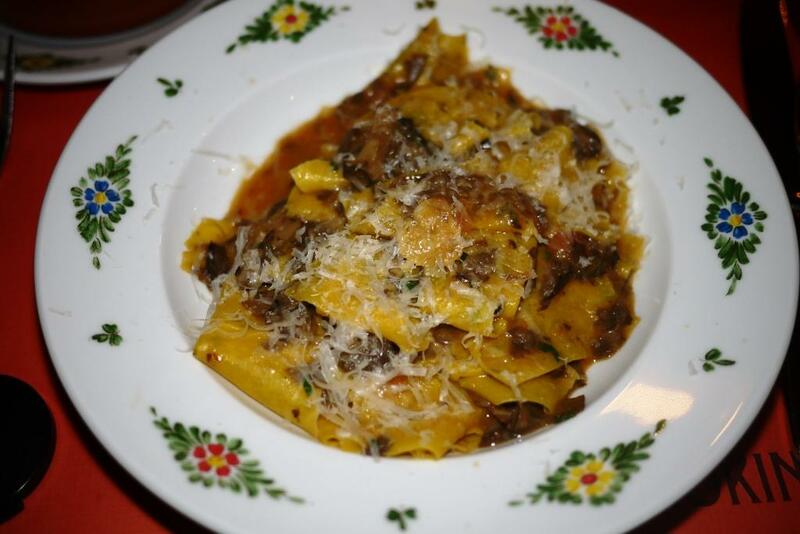 Even better is stracci with braised wild mushrooms. The wide ribbons of stracci are chewy, earthy, and impossible to resist digging in for another bite. 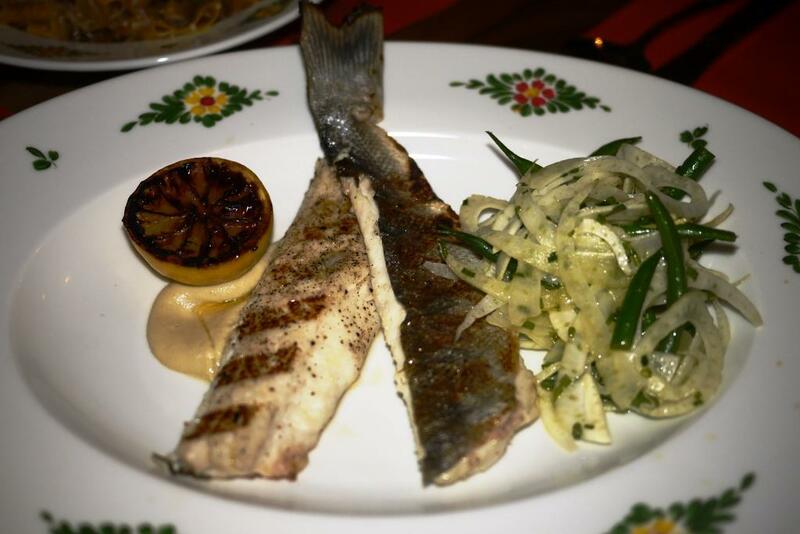 Branzino is another winner, simple but expertly prepared with fennel, green beans, and charred lemon. I only have two bones to pick with Osteria Morini. Brussels sprouts with pancetta are mushy and bland. We now know that brussels sprouts have the capacity to shine, so these are disappointing. We’ve almost completed our entrees when a server appears with a basket of foccacia. Where was she earlier in our meal, when this would have been a welcome sight? These are minor irritations, and don’t make a dent in affecting the good vibes we are feeling towards our meal. Full disclosure…we order two desserts but after seeing a tweet I’ve sent, pastry chef Alex Levin appears at our table with two additional desserts for our group to enjoy. The former finance executive, turned pastry chef, has found his calling. I am enthralled with banana caramellata with milk chocolate crema, brownie, pine nut crunch, stracciatella gelato. I tackle it before my husband has a photo opp. Oops. We are also captivated by a special dessert not yet on the menu. 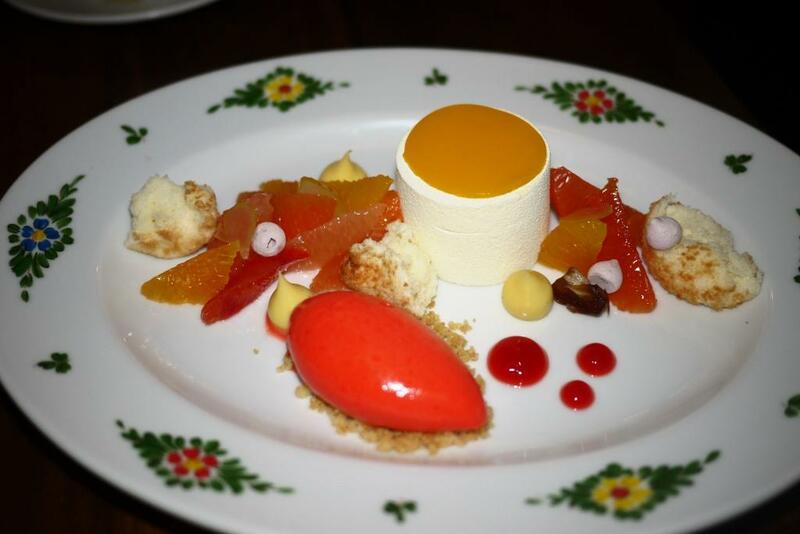 Ricotta Bavarian is topped with mandarin gelee, and accompanied by angel food cake, passion fruit curd, fresh citrus, red wine meringue kisses, and grapefruit campari sorbet. This is beautiful, refreshing, delicious, and hopefully will take its place on the menu soon. 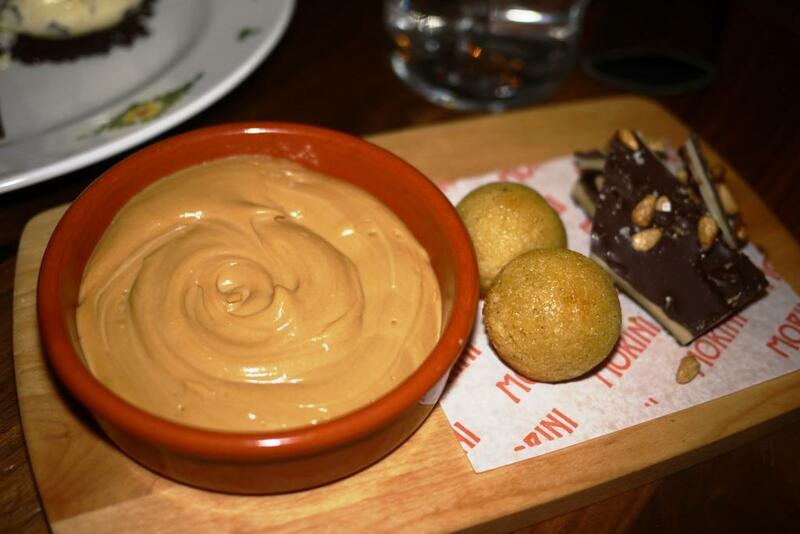 Budino consists of butterscotch crema, olive oil cake, dark chocolate toffee crunch, and pine nuts. 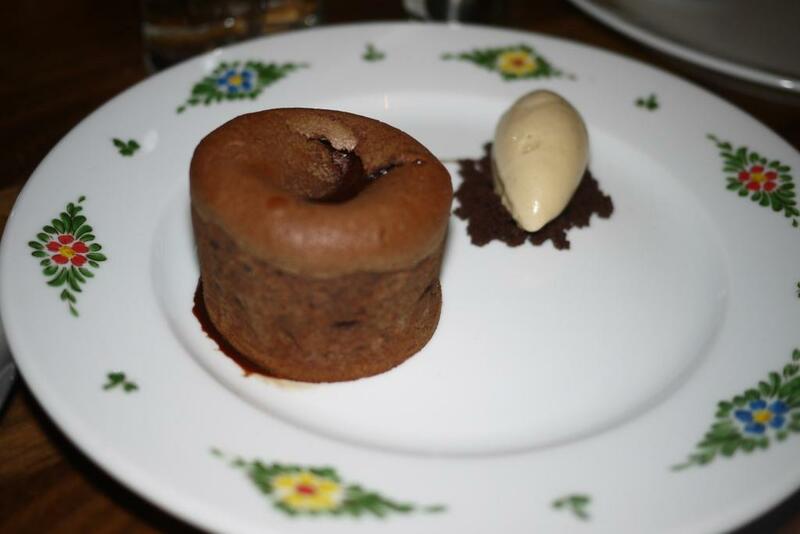 Tortino al Cioccolato features warm chocolate cake with a liquid ganache and espresso gelato. It’s difficult to save room for dessert with so many worthwhile savory dishes. My advice is don’t resist. Over-indulge and have dessert. One of my friends admits that earlier he had grumbled to his wife about heading downtown for dinner. The Navy Yard area gave him more cause for complaint. After dinner he sings a different tune, and even asks if he can make a reservation for dinner next summer. Osteria Morini is guaranteed to be a very hot spot this summer, particularly before or after games and concerts at the stadium. I may or may not get to Nationals Park in 2014. But I will definitely get to the Navy Yard area, now that Osteria Morini gives this non-sports fan something to cheer for.